Winner of Free Hamper of Gluten-Free Goodies Announced! Using a highly technical procedure (ie the names in a big mixing bowl), the winner of the free hamper of gluten-free goodies is…. …. Lizzie Ellis. Please send me your address to grace @allergyfreecook.com and I’ll get the hamper sent to you. Congratulations! Many thanks to everyone for entering – and for the recipe suggestions. I loved them all – yum! In my role at the publishers DBP, I have been working on a book that has just come out – Nourish: The Cancer Care Cookbook. Written by the team at Penny Brohn Cancer Centre and nutritionist Christine Bailey, it shows you how to create delicious meals, snacks and drinks that are packed with nutrients to support your body if you have cancer. The introduction to the book explains the role of nutrition in protecting against cancer, helping to alleviate some of the symptoms, and forming a crucial part of any cancer treatment programme. And then there are recipes for shakes, juices, smoothies and breakfasts, soups and light meals, main meals, desserts and baked treats. There are also recipes that are designed specifically to help with the common side effects of treatment. 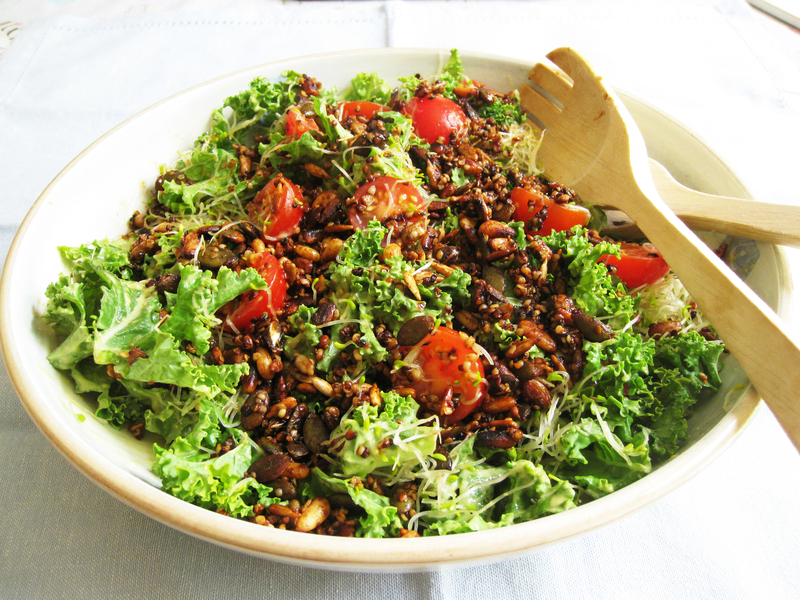 The recipes are easy and quick to prepare, and highly nutritious. To make the toasted seeds and nuts, put them in a dry frying pan over medium heat and lightly toast for 1 minute, stirring. As they begin to colour, pour over the tamari and stir to combine. Stir for 1–2 minutes until crisp. Leave to cool. 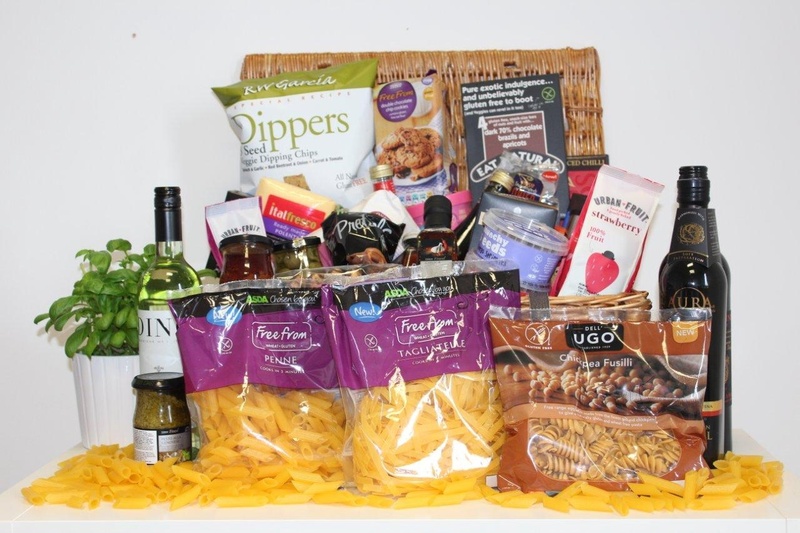 Free Hamper of Gluten-Free Goodies to Celebrate Coeliac Awareness Week! This week is Coeliac Awareness Week – and I have a gluten-free hamper to give away (worth approximately £100)! Ugo Foods are offering a hamper filled with gluten-free goodies to give away to one lucky winner. This includes Asda’s new fresh chilled pasta and also Dell’Ugo’s fresh Chickpea Fusilli (winner at this year’s FreeFrom Awards which I wrote about), as well as other gluten-free items. Asda has just launched two types of gluten-free fresh pasta under its Free From range – a penne and a tagliatelle. Made from cornflour and rice flour with the addition of water (no additives here!) it cooks in 3 minutes. Both pastas are fresh (you’ll find them in the chiller cabinets) and sell at £1.50 for a 300g bag. Asda have been working incredibly hard on their Free From range. They have a huge range of products – and they’re all inexpensive. These pastas hold together well, and taste really, really good. It’s definitely worth buying fresh pasta, as opposed to dried, because they do taste better. And I particularly loved the tagliatelle. Dell’Ugo is the UK’s largest fresh pasta brand and specialises in making filled and unfilled pasta, based on authentic Italian recipes. For me, the Gluten-free Chickpea Fusilli is really great pasta. Not only is it gluten-free, but it’s also completely grain-free. And chickpeas are wonderful because they’re high in soluble fibre and they’re a slow-burning complex carbohydrate, gentle on the digestive system, high in soluble fibre, high in B vitamins especially folic acid and minerals, and the phytonutrients in chickpeas act as a powerful anti-oxidant. To win the hamper, go to the facebook page and follow the instructions… Good luck!